Cocoa brown color; flawless purity. First off, I pick up succulent aromas of brown butter, bacon fat, dried flowers, and muesli; secondary whiffs detect deeper aromas, namely honey, ginger, toasted oak, saltine cracker, and dried apricot. Entry features immediate impact tastes of dark honey, baked fruits (apricot, banana), baking spices (clove, cinnamon, vanilla), and toasted marshmallow; midpalate turns prune-like and raisiny as the taste profile shifts to a ripe and baked fruit posture that’s sweet and succulent. Finishes long, prune Danish-like, full in the mouth, and peppery. A session Bas-Armagnac that’s refined, mature, and ambrosial. Absolutely must be on your brandy wish list. It was in 1838 during the reign of Louis Phillipe taht Pascal Dartigalongue, originally from Saint Lannes near Madiran, moved to Nogaro in the Gers and founded his maison d'Armagnac which is alive and well today. He very quickly realised that armagnac could be a successbul export product. Despite many difficulties he managed to send aok casks of armagnac to Bayonne where they would be shipped on to Holland And England. In 1870 he acquired our present vineyard, "lacroutz", at Salles d'Armagnac (from which we have taken our brand name "Croix de Salles"). In about 1900 Joseph's son Henri took over the family business. 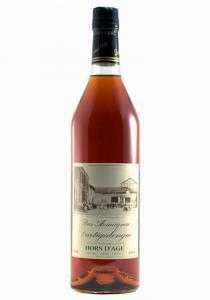 It was at his time that Eau de vie officially became Know as Armagnac and acquired the appellation 'Jaune d'Or'. Thanks to the continuing expansion of the railways the trade in armagnac also continued to grow. In 1930 Henri's very young son Pierre took on the responsibility of visiting their clients, first in France and later abroad. This initiative increased sales dramatically. In 1936, at the end of prohibition, he went to the USA and did some very good business with the Americans. After the end of the second world war he developed the sale of armagnac throughout Europe . His son Jean-Pierre and his daughter Françoise now run the family business. They take pride in mainaining the century and half old family traditions of service and quality and living up to the family motto "My Armagnac, my strength".